Two blooms of note this year at Travelmarx headquarters are from a Callistemon and a Beschorneria plant. Callistemon usually goes by the common name of Bottlebrush because the flowers look as if you could clean a bottle with them. Since ours is red I’m sure now it’s Callistemon citrinus even though the tag that came with the plant said sieberi. We purchased it over a year ago and this is the first time blooming. The Callistemmon has a great form and presence all year round being evergreen; now with the feathery red flowers it’s even better. The genus name Callistemon means beautiful stamens from the Greek 'kalli' or good. The species name citrinus refers to the lemony scent of the leaves. The plant is native to Australia. The other interesting bloomer this year is a Beschorneria septentrionalis x decosteriana – a soft-leaved agave relative from Mexico. (I’m guessing on the species because the tag that came with the plant read Beschorneria decosternum which doesn’t seem to exist and probably was a typo.) We’ve had it for about three years and it finally bloomed this year. The genus name honors Friedrich Wilhelm Christian Beschorner (1806- 1873), a 19th century German botanist. The species name septentrionalis means northern or belong to the north. In terms of the meaning of decosteriana the web would not reveal the answer so we'll have to let that be a mystery. This is the second of several posts dealing with the Sonos system. (Click the "sonos" label keyword above to see all the posts.) 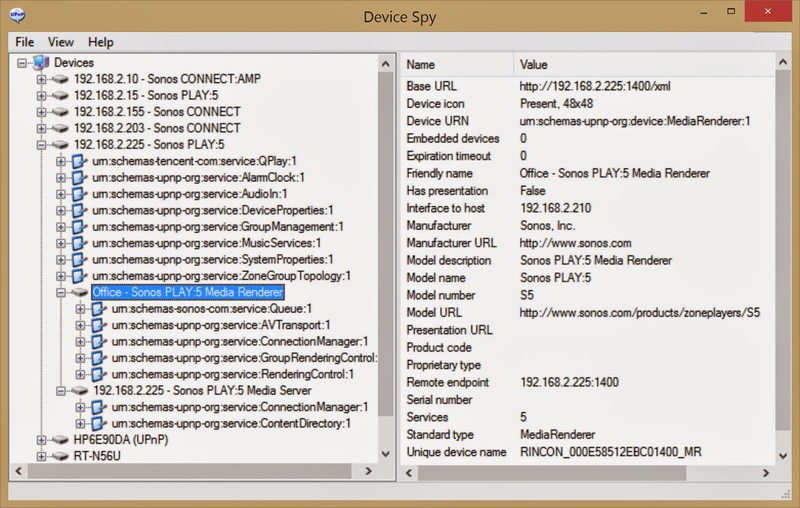 The goal of this exercise was to get information about what Sonos is playing in a browser. The first post looked at simple ways of discovering your Sonos system. This post continues where the first post left off and creates a web page to display what Sonos is playing along with album artwork. 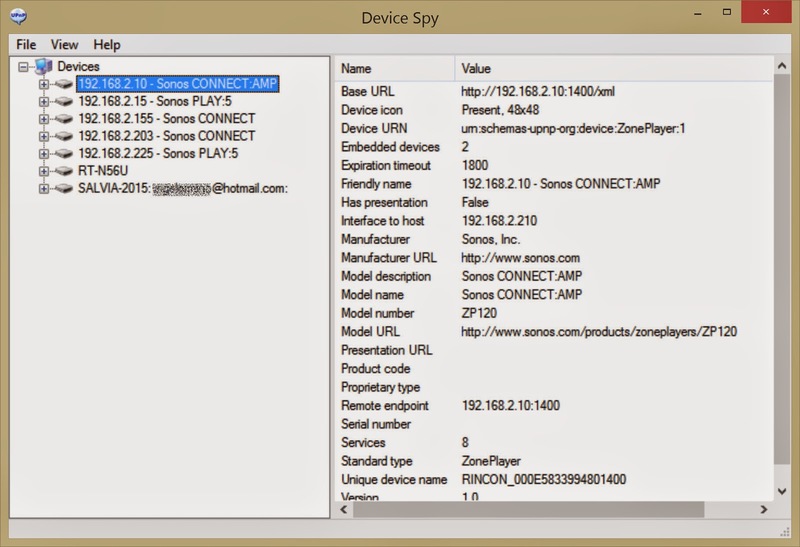 I took inspiration for the code shown in the page below from this particular post on the Sonos Forums. You can run the page shown below on a web site hosted locally or just run the page as is (e.g., double-clicking it). We only tested this code on Windows 8 with Chrome (version 35) and Internet Explorer (version 11). In these browsers you may have to disable the same-origin policy. 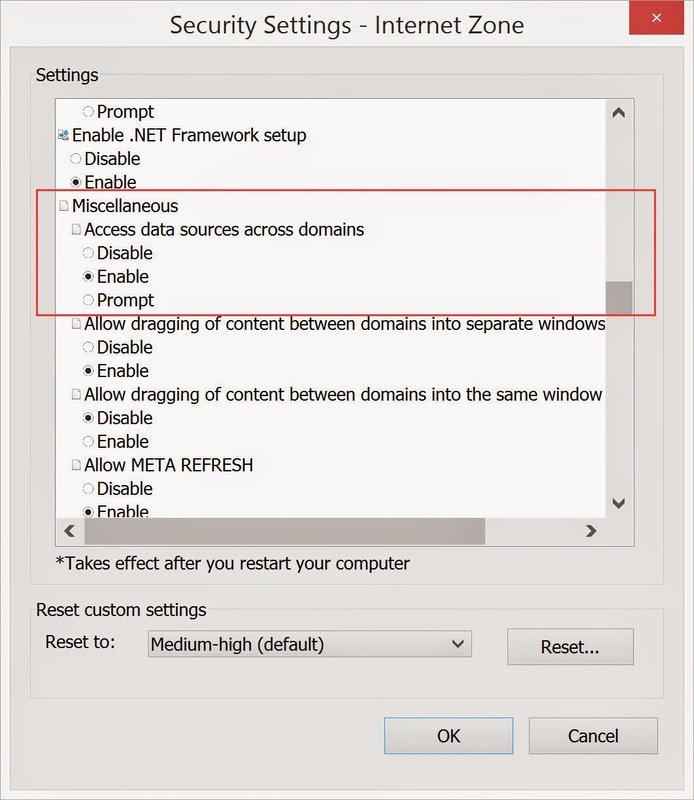 The image below shows how to disable same-origin policy in IE (or enable data access across domains). Go to Internet Options / Security / Miscellaneous "Access data sources across domains". Better yet you might want to set it to Prompt. When done experimenting, you put this settings back to Disable. 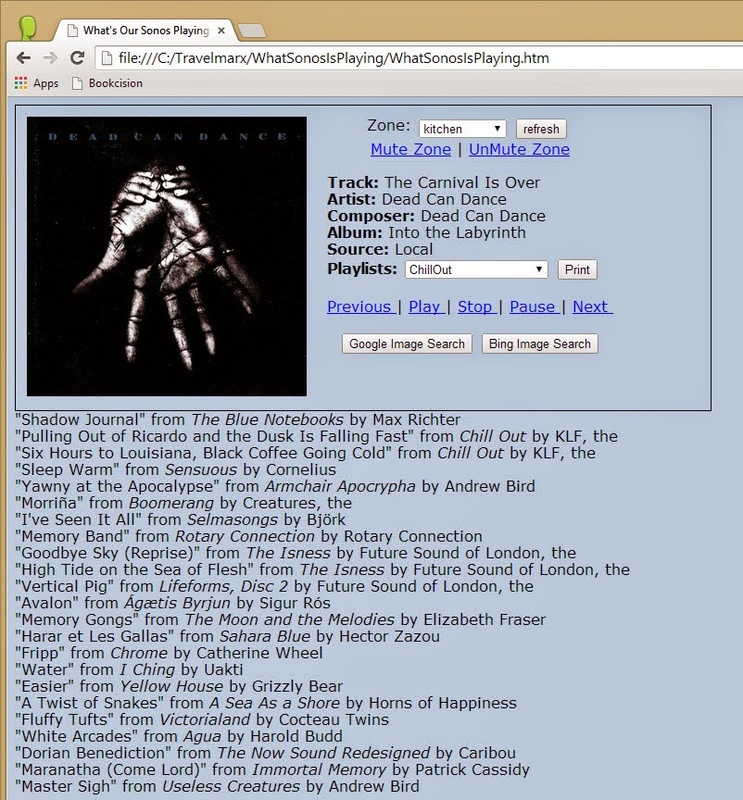 The web page her uses POST requests to the zone players which include a SOAP body. 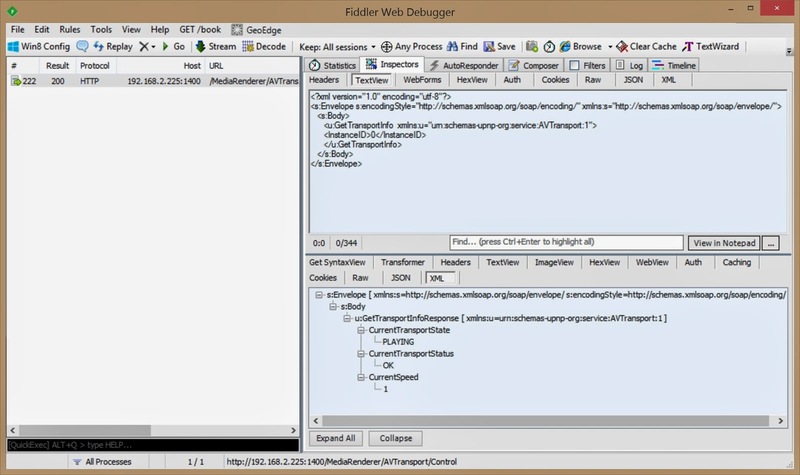 The response includes XML to parse with status or metadata. 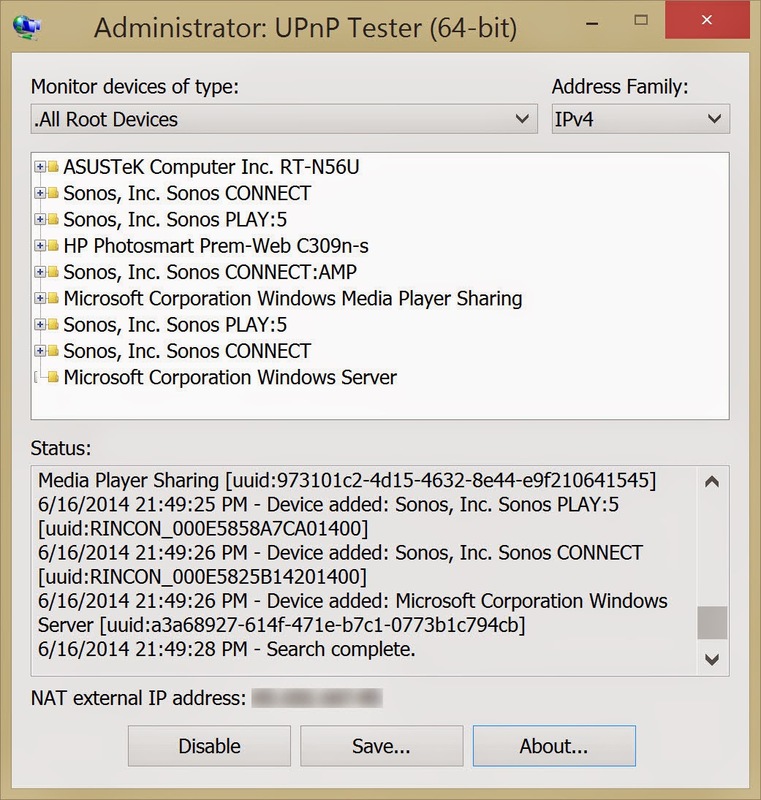 To understand more about this type of request, see the previous post Exploring Sonos via UPnP. Customize the code for your situation, in particular the _sonosTopology variable. The more general solution to deal with same-origin policy is to use Cross-Origin Resource Sharing CORS. What wasn't clear to me is if the Sonos zone player (i.e. the server) could deal with CORS, let alone that you could set the proper headers. All the code is in one page for demonstration purposes. The parsing of the XML returned for various queries is not optimal. Encoding/decoding URLs and escaping/unescaping certain characters in XML can be tricky - I'm sure there are some scenarios where it is needed but were missed in this code. This code is shown below and can also be found on Github here: https://github.com/travelmarx/travelmarx-blog/blob/master/WhatIsSonosPlaying/WhatSonosIsPlaying.htm. // Global variables that need to be customized to the environment. 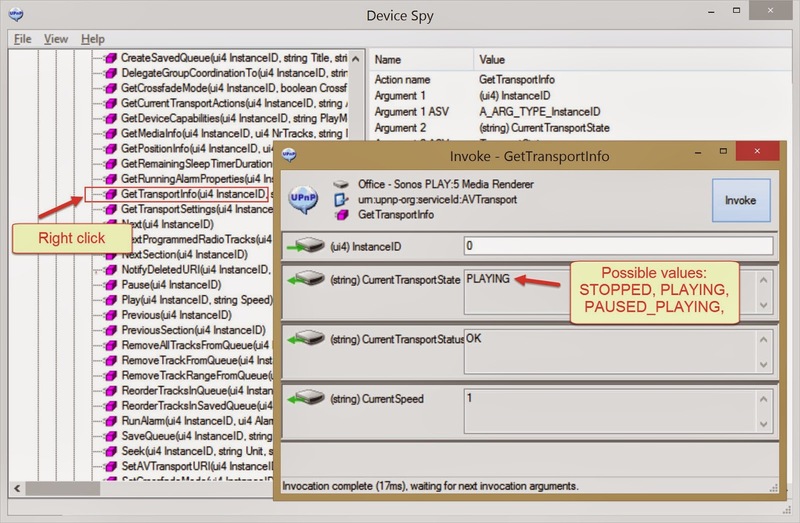 // Device Spy.exe to get these, http://opentools.homeip.net/dev-tools-for-upnp. // Global variables that don't need to be customized to the environment. var _debug = false;  // Browser security settings may prevent this from working. // Once the DOM is loaded then we can work with HTML elements. 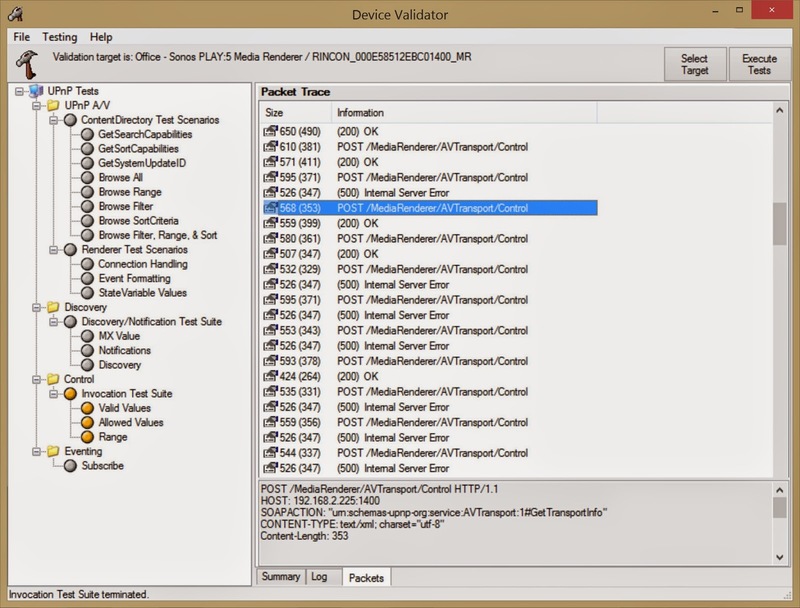 // UPnP devices and dealing with the response. // Function to process Play, Stop, Pause, Previous and Next commands. // Get one playlist based on its identifier. // Set some globals to default. // Main Ajax request function. uPnP requests go through here. // Here we use jQuery Ajax method because it does cross-domain without hassle. // If this isn't a metadata request, then we should refresh the metadata to sync UI. 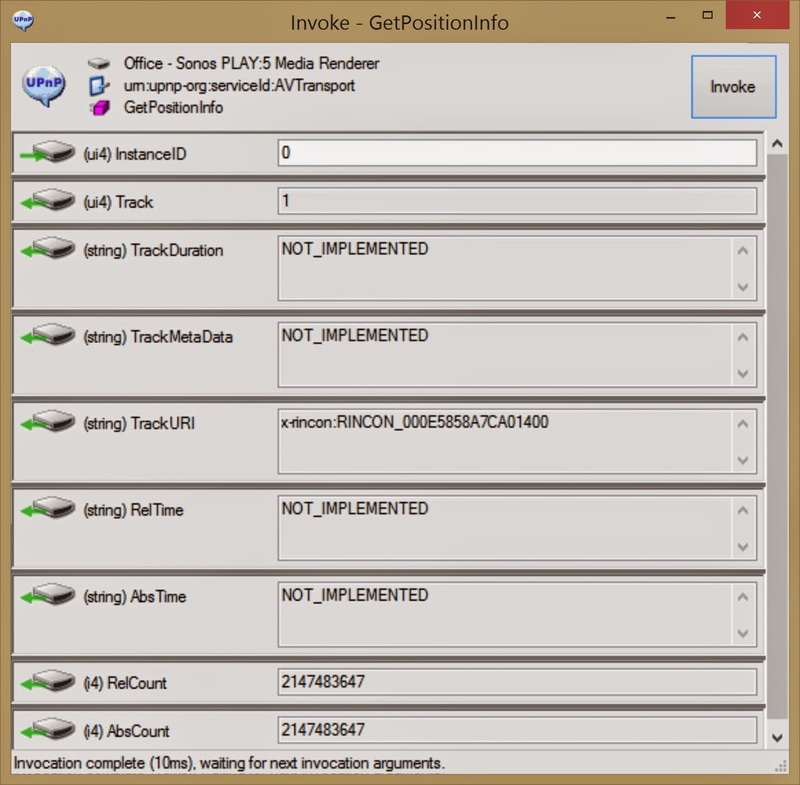 // Process data of one playlist. // Process data from list of playlists. // Refresh display on what's currently playing. // Start dump of one playlist's items. // Do simple Google image search by opening a new window. // Do simple Bing image search by opening a new window. <img alt="currently playing" id="albumArt" src="about:blank"
Use auto-discovery of Sonos topology instead of a fixed array of the topology as done here. 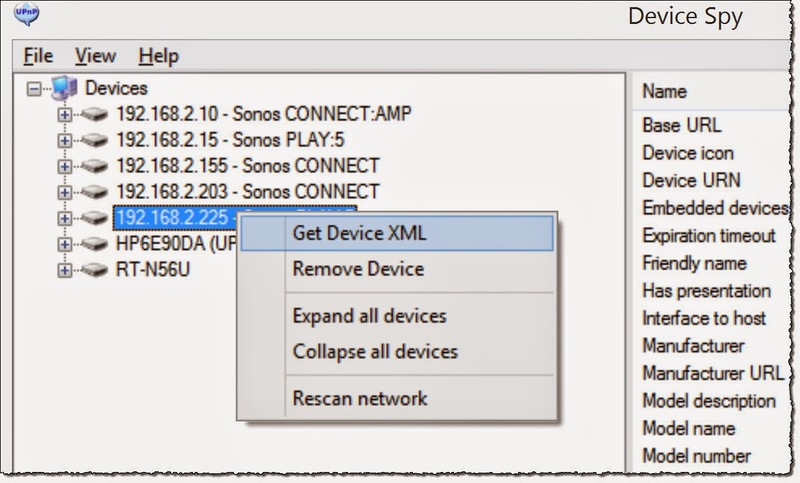 Subscribe to UPnP events from Sonos to sync UI. In the page below a simple timer is used to poll for changes. It would be nice to go to a subscription/callback approach. From what I read it should be possible, but I never got event subscription to work with Sonos. When choosing a slaved zone, the current page just informs you that it is a slave. The page should take next step go to the coordinator for metadata. 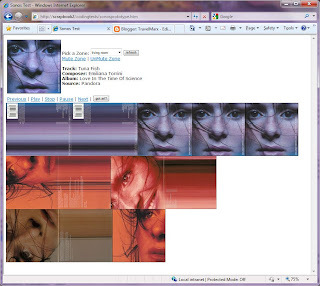 Use jQuery plugins to display additional images in a carousel or other interesting display. Stop flicker when metadata update occurs. This is caused by the approach of hiding/showing data elements. It’s not elegant and can be improved on. If subscribing to Sonos events is figured out then this becomes a non-issue. I think there is more resolution for album artwork returned in Sonos metadata. It would be nice to use it. Update January 2011 A reader, Finn Ellebaek Nielsen, of this post (see comments below) contributed the following small Java application that saves the current queue as both a playlist (.m3u) and a text file with track number, artist and title. The source code is on GitHub at well: https://github.com/travelmarx/travelmarx-blog/tree/master/PlayListExtractor. which takes the queue controlled by the Sonos master with IP address 192.168.1.13 and saves it to c:\playlists\queue.m3u and c:\playlists\queue.txt. Figure out which of the players is the master one. Programmatically clear the queue, find the given Sonos playlist to be exported and place this on the queue. With the current version you have to do this manually. We first ran into the Italian sculptor Marino Marini (1901 -1980) in Venice where his (in)famous sculpture Angelo della Città greets the boats on the Grand Canal spread-eagle-style from the terrace of the Peggy Guggenheim Collection. Next we ran into him while living in Florence and we spent an afternoon at his museum in Piazza San Pancrazio. Recently, we saw Angelo della Città again at the Getty Center. According to a Getty acquisition list the full title of the work is: Angel of the Citadel-Horse and Rider-Town’s Guardian Angel, 1949-1950, Bronze, 172.7 x 167.6 x 94 cm, but that’s a mouthful. For more on Marini’s inspiration from Etruscan and Northern European sculpture for this composition see here. Just when I was getting down on Fremont (the Center of the Universe), this note and lupine flower (Lupinus perennis) shows up on our doorstep to be found by us Monday morning. At least one other neighbor received a note and flower too. Monday was the summer solstice after all and Fremontonians love to celebrate the solstice. To the child and parent who collaborated on this gift, thank you, you made our day. 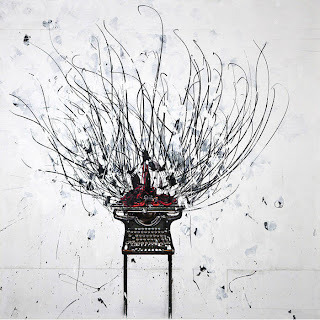 A fun show of the latest work of the Canadian artist Andre Petterson is now at the Foster/White Gallery in Pioneer Square, Seattle. 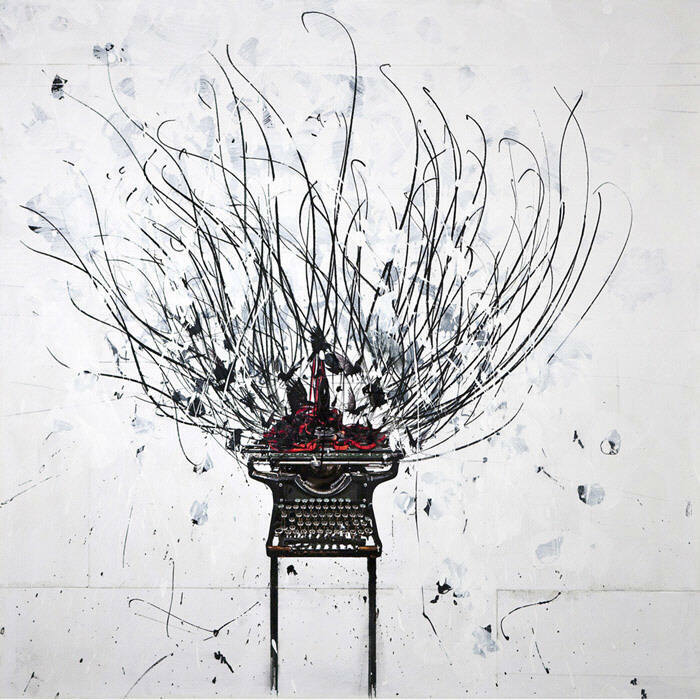 The name of Petterson’s show is STICH.PRINT and in the show you’ll see images of typewriters, adding machines, and sewing machines usually exploding and swirling with inky and squiggly lines, characters, tape, plates, birds, and wire. It’s like these venerable old machines want to say “see we are still here and you wait, you’ll be obsolete too someday” – like a last portrait of an unkempt movie starlet from days of yore. Be that the case, there is still something timeless and satisfying about these images. In the case of the sewing machines, Petterson was inspired partly by their continued use in developing countries. Obsolete is relative. 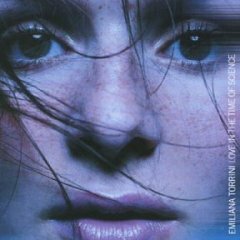 I’ve always wanted to work in Unemployed in Summertime since I first heard this song by the talented Emiliana Torrini (from her Love in the Time of Science release). Alas, it applies to my situation now – at least for a few more weeks. In the space before my next trick (the last trick a la Anja Garbaek?) I’m taking some time to see what’s the latest in programming languages – since I feel like a pre-dinosaur of sorts (see for example diictodon which plays a role in the interesting BBC series Walking with Monsters that we saw recently.) Anyways, I found the TIOBE index and the LangPop index of languages which rate programming languages by popularity. What’s popular as a measure is problematic as pointed out elsewhere, however, it is not without interest as a measure of some kind of common currency of communication. I guess I felt a bit deflated since the top 5 languages of the TIOBE index and the top 4 of the LangPop index are not languages I use at all. So I grit my teeth and decided to take a look at Python (not the snake) because I overheard a teenager talking about how awesome Python is. Maybe it's not the best reason for picking up a new language, but I'm unemployed in summertime so I have the luxury of entertaining bad motivation - at least for a little while. A friend gave us an Epiphyllum oxypetalum plant a few months ago, one of the several species with the common name night-blooming cereus that are members of the Cactus family. I’m pretty sure ours is E. oxypetalum. The plant itself is honestly a bit gangly with an unruly growth habit, though not without its charm. E. oxypetalum’s special treat is its one-night, fragrant blooms. So far we haven’t experienced any blooms and it looks like we won’t this year. The friend shared some blooms from previous years so we know what we are in store for. The first thing we did is cut it back (late spring) as it had one large stem that dwarfed the main plant. From what we’ve read, new blossoms come on new growth. From that cut stem we took several leaves and propagated them very easily. The method we used was to place the lower part of the dried-off leaf between two moist paper towels. In a week or so, roots develop. Then we cut the paper towel out (as the roots were stuck pretty well to it) and put it in soil. The photo with this post shows two potted plants, one sprouting new growth from the leaf and the other sending up new stems from the base. The photo also shows some other starts in paper towel. Name origins: Epi = on or over and phyllum = leaf. The genus name refers to the fact that the blooms are on the margins of the leaves. Oxy = sharp, from the Greek “oyxs,” and petalum = petal. The species name refers to the bloom’s sharp-looking petals? (I don't remember them being much more than sharp-looking.) The common name cereus = Latin for “waxy” referring to the waxy nature of the plant leaves and stems. What’s your end result? Is your end result going to be web page that is external to Facebook like TripAdvisor (with FB login button e.g.) or is it going to be an application that runs within Facebook (i.e. has the Facebook chrome around it) like the TripAdvisor Travel Map (see the application directory for more applications)? Or will it be both external and internal to FB. In this post, I’m tackling the first scenario (external), though the code can be used for the second scenario as well. Before showing the code there are a couple of things to point out. 1) If you are using FBML like fb:login-button or fb:comments don’t forget to include a namespace declaration so that the prefix “fb” is understood. They rarely mention this in the docs. 3) In this code sample, I use jQuery as well, so I load that too. It doesn’t matter where you load it from; the sample here loads it from the Microsoft CDN. 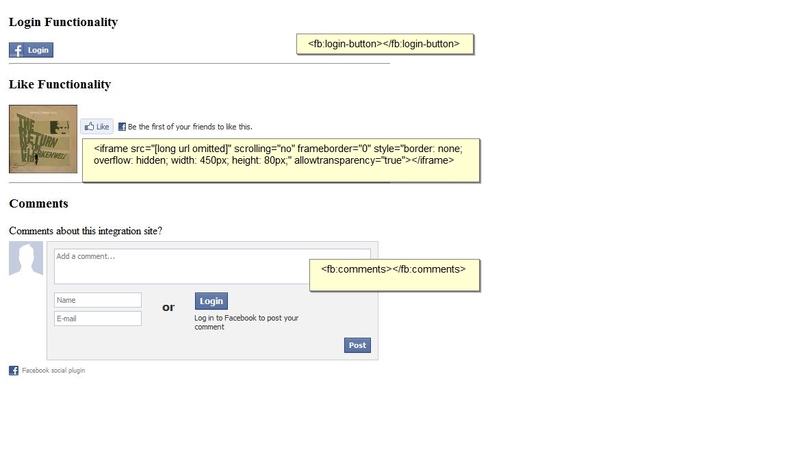 4) The FBML tag for like functionality fb:like did not work. had to resort to using an iframe. Last I saw there was a bug open for it. 6) The FB login button doesn’t have a counterpart, log out. I was expecting that. So you have to provide your own log out feature and manage the displaying and showing of it and the FB login button. When the user is logged in, don’t show the FB login but show logout. 7) The code sample below worked in Firefox 3.6.3 and Chrome 5.0.375. But alas, IE 8.0 presented several problems where the consent/authorization dialog would not go away and the page ½ functioned. I saw mentions of this behavior in the forums, but did not pursue. Hopefully it gets worked out. 8) The div with id=”fb-root” is required, but nowhere is there a hint as to why it’s needed. Looking at the all.js file it looks like it might be used for cross domain communication when dealing with older browsers. Debugging and looking at what was inside the fb-root div during various times in the page lifecyle, I never saw anything in the div but that’s probably because I’m using a “modern” browser. In fact, I looked at the FB.XD._transport variabel and confirmed I was using “postMessage” capabilities of HTML 5 – which is the latest and greatest. Here’s the code sample, a simple HTML page. You must run this file in the context of a web site. For example, register an application and get an application ID at Facebook, host the page on a web site locally on your test server (the same domain you registered), and place this page in the web site and browse to it. I used HTTPS for all my tests. // A user has logged in, get cookie information. // No session. Take action if needed. 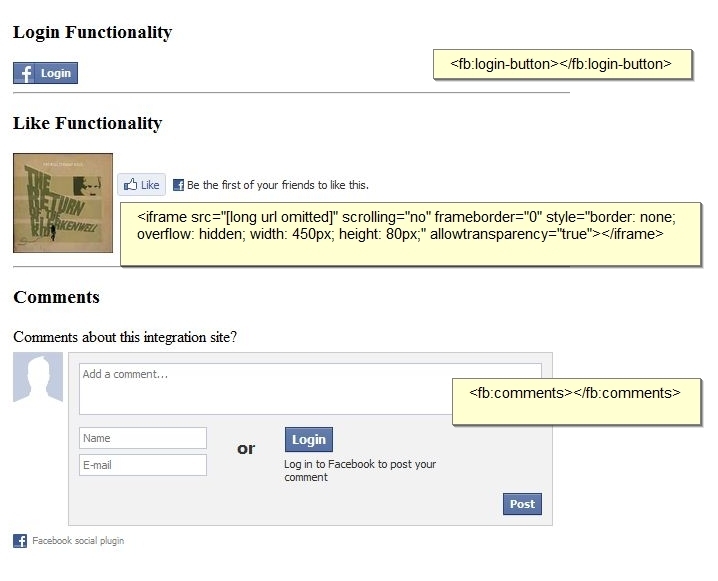 The Facebook Graph API is for developers who want to integrate with Facebook and read and write data from Facebook. (The docs are here – sometimes it makes me sign in to see the doc!?) What you need to know to start is that “graph” really means a “social graph”. For example, a user’s social graph includes all the things important to a user like people, photos, friends, and shared content. Data in a social graph falls into two categories: objects (like people, photos, and events) and connections between objects (like relationships, shared content, and tags). When you work with the Graph API you’ll be working with objects and connections. You can start getting familiar with the Graph API without an application ID by just constructing Graph API requests directly in a URL. Note, that Chrome and Firefox browsers display the JSON results of these requests directly in the browser which is nice. If you put the URL above in the address bar of Internet Explorer it will ask you want to do. You can download it somewhere, name it .txt and view it. Just more work. If you put this URL (https://graph.facebook.com/68310606562?metadata=1) for the founder of Facebook, Mark Zuckerberg, into the address bar of Chrome you get the publicly available data for his page (an object). 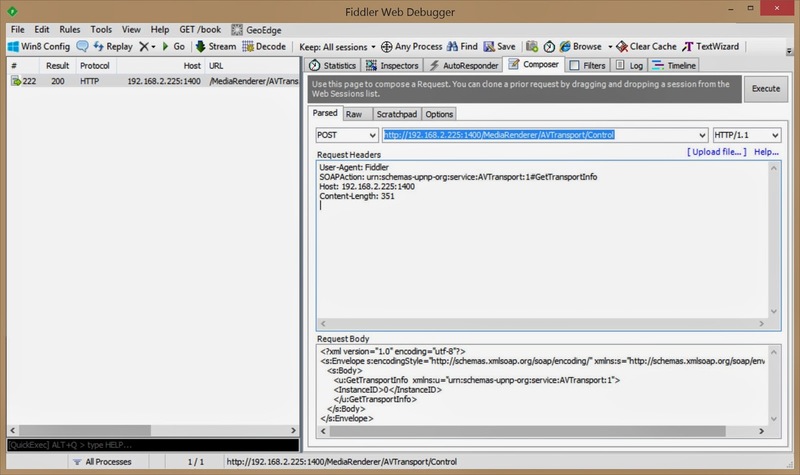 The “?metadata=1” part of the URL requests that connection information for the object be shown. The results of the Graph request above will give additional Graph requests you can follow and drill down into the data. So for example, take Mark Zuckerberg’s photos link (https://graph.facebook.com/68310606562/photos) and put that in the browser address line and so on. This is what I started doing at first for myself and friends - Graph requests in a browser - to see how it worked. Then, I wanted to automatically check all the links without doing so much cutting and pasting and that’s where the code shown below comes in play. I created a first version and then found this page (http://zesty.ca/facebook/) and created a second page with some of the good ideas I found there. I wanted to play around with jQuery and issuing Ajax requests from the page so that drove the design of my page. My page checks all the connection links and displays the results (what was found) in the page. The previously mentioned link (zesty.ca) is a simpler and slicker page in that it’s just based on navigating to URLs. 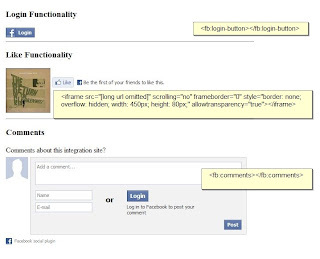 The code below uses the ajax method of jQuery to get data from the Facebook Graph API. No data is written back. A big gotcha is that I could only run this code successfully in Internet Explorer. In Chrome or Firefox, it was a no go. I didn’t troubleshoot enough to find out why, though I saw others had problems with the ajax method in these browsers. I’ll revisit the issue. link in Facebook. This test does not require a Facebook account or to be logged into Facebook.